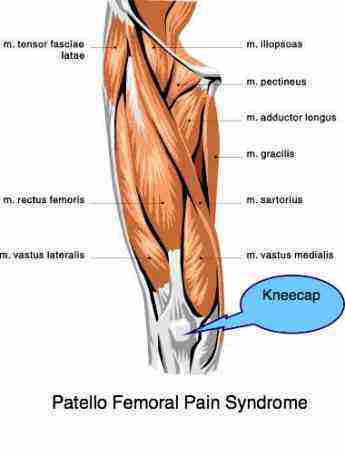 Patello Femoral Pain Syndrome under the kneecap is very treatable. 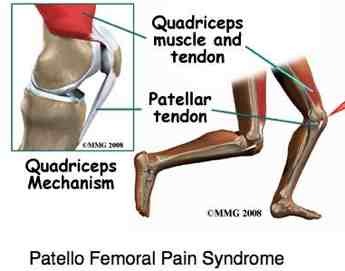 Patello femoral pain syndrome, felt around the kneecap, make come from a direct fall, or because of an unusually shaped groove in which it lies and moves, or from some other injury. It's often abbreviated to PFPS. This condition causes pain around and under the kneecap due to bruising or degeneration of the cartilage under the kneecap. More specifically, in the joint between the patella and the femur, hence the name. The quadriceps muscle is a group of four extremely powerful upper thigh muscles. Their function is to flex the hip, raise the femur, and extend the knee; straighten the lower leg at the knee. There are more muscles in the thigh obviously, those at the back and sides of the leg, so that we can stand upright, and all four feed into the patella. Their names, should you want to know, are the rectus femoris, vastus medialis on the inner thigh, vastus lateralis on the outer thigh and vastus intermedius which lies underneath the rectus femoris and isn't shown. But really, don't bother about their names. For example, when raising yourself up from a sitting to a standing position, as in getting up from a chair, the quadriceps is the primary muscle in the leg that is used. Obviously in walking, running and jumping the quad, as we call it, is a prime mover. The forces transmitted to the lower leg via an ingenious system of tendons are enormous so, to protect the quadriceps tendon from fraying as it passes over the femur bone, a very special small bone called the patella, the kneecap, is provided to transmit the forces smoothly to the lower leg. 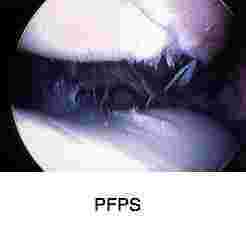 Underneath the kneecap lies the pain source of patello femoral pain syndrome. The condition is reckoned to be responsible for about a third of knee pain; it's more common in adolescents and women. In the graphic above, can you see the two tendons; the quadriceps tendon above the patella and the patella tendon below the patella; and can you see the patella itself in the middle? A fall directly on the kneecap, especially in heavy people, grinds the patella directly onto the cartilage of the thigh bone, and is a frequent cause of patello femoral pain syndrome in the elderly. But obviously it happens to the young sportsman, or just a kid playing on the street. Think not only of the grazed skin on the kneecap but also what may be happening under the kneecap. Because of this overwhelming stress on the patella, the cause of patello femoral pain syndrome, the hyaline cartilage under the patella is thicker than on any other bone in the body. Thicker even that on the hip. 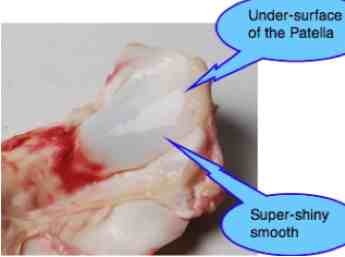 Next time you pop into the butcher, ask him if you can see a patella. 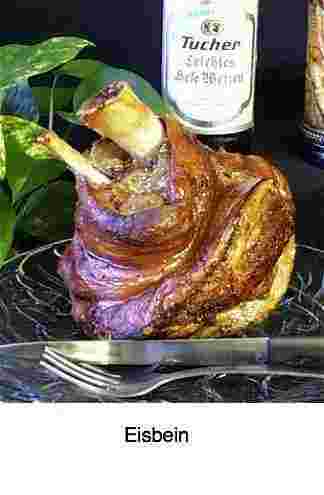 A poor little pig's kneecap perhaps? 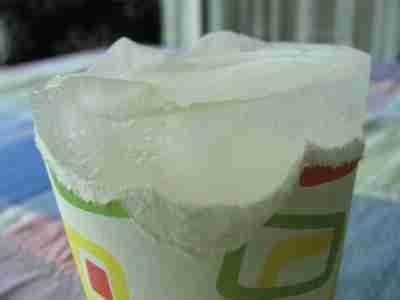 Rub your finger over the cartilage and you'll note that healthy hyaline cartilage is more slippery than ice! The diagnosis of pain under the patella is made with an orthopaedic test called clarke's test. I'ts been found that the presence of knock knees, or increased hip adduction, adds to poor patella tracking. Also, limited hip extension, as in one form of femoro acetabular impingement syndrome, may contribute. Hip extension weakness too may contribute. A consensus report from the third international patello femoral pain syndrome research retreat in 2013 concluded that careful evaluation of both the hip and the foot is important for a successful outcome. Noble's test will help exclude an ilio tibial band syndrome. Hyaline cartilage is the tender heart of Chiropractic; damage to it results surely in knee arthritis symptoms. There's very interesting research coming out on nutritional support for hyaline cartilage. The gelatine in chicken bones and omega 3 fatty acids, for example. How much fish oil, freshly ground flaxseed and walnuts come to mind. How much fish oil? to restore worn hyaline cartilage? Dem CHICKEN BONES; don't chuck 'em, excellent for hyaline cartilage. See how. Then take a delic Eisbein home, bake it so the fat is lovely and crackly crisp, and enjoy it with mashed sweet potatoes, peas and, if you have the privilege of knowing someone who can brew, yes, it's brewed like beer, some sauerkraut. Make sure you take it with a decent Greek salad. Otherwise you'll find your cholesterol going into orbit. We love our salad with BABA GHANOUSH lekker in Dutch, and easy to make and excellent too for high cholesterol. Sorry vegetarians, in poor taste, I guess. Seriously though, this cartilage is really prone to wear and tear. Beware you obese ladies, it's the hyaline cartilage under your knee cap, and in the knee itself, that's going to get you. The knee was overdesigned for stress, but not for 90 kg+. Nature never figured that humans could get that heavy. Serious pain from PATELLO FEMORAL PAIN SYNDROME is being scribbled on your menu! Think about our free weight loss recipes and vegan weight loss has some fantastic ideas too, even if you don't go wholeheartedly into veganism. Sexism? Nope, because of the so called Q-angle in the hip, women are far more prone to hip and knee problems. And there are very few exceptions if you are exceptionally heavy. There are other reasons too. 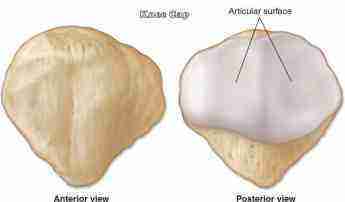 Sometimes because of malformation, the patella rides high (or low), and even subluxates and dislocates. A good crack on the patella with a hockeystick, a hard fall, full on the kneecap, or simply having to negotiate the Thirty-nine Steps ten times every day. It doesn't take rocket science to diagnose PATELLO FEMORAL PAIN SYNDROME. The presentation is usually fairly clear. Pain whilst kneeling on the kneecap, pain getting up from kneeling or squatting or getting out of a deep chair, pain on the stairs. Usually walking on level ground is less of a problem. The diagnosis is confirmed by a standard orthopaedic test: Clarkes test ... Read more. What's to be done? 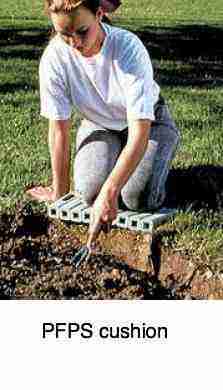 Plenty with Chiropractic Help ... incidently if you also have a lower back pain problem, gardening on ONE knee rather than both as this lady is doing would be more comfortable. PATELLO FEMORAL PAIN SYNDROME is one of those conditions that nobody mentioned in my training. It probably hadn't yet been named. Yes, I'm getting a little long in the tooth! Simply forced to figure things out, it soon became evident that PFPS responds like all other joints problems to the basics of chiropractic care. Whether it's lumbar facet arthritis, hip arthritis, ankle mortice joint pain, they all respond mostly to the basic chiropractic principles. Mobilise the joint, use some ice if there is swelling and inflammation, give some quad exercises called Quad setting, and heypresto, this condition that medicine seems to think is untreatable ("I'm afraid you have arthritis, Mrs Jones, you will just have to learn to live with it, there's nothing to be done.") actually responds astonishingly well to Chiropractic help. One protocol that I use, is to grind the patella quite hard onto the femur - to tolerance of pain - and astonishingly the really rough crystals can be ground down. There will be some pain for a few days, some swelling but nothing that ice can't handle, and hey presto, it gets better. Not cured, mind you, but much much better. And, if your weight is the problem, and you don't do something, expect an early retreat to the rolator and loss of independence. This condition will make your quad weak and that's serious. Going down on your haunches puts unbelievable stress on that cartilage under the knee-cap. When you need to garden, or pick something off the floor, get into the habit of going down on one knee, rather than squatting. Kneeling can also be a problem, placing direct pressure on the knee-cap. Find an old cushion, and carry it around with you in the garden. Don't kneel on a hard floor. Incidently, if you have back problems, going down on one knee is rather better than on both when in the garden, for example. Tip: Youtube video sticking? Click on the Play arrowhead in the middle of the screen, then immediately on the left just above "Info" you'll see see two vertical lines //. click on it. It will change to an arrowhead and stop the video and if you look very carefully, you'll see a pale pink line advancing faster than the red line which will now be stationary. It's downloading the video onto your computer. When it reaches the end, or near the end, click again on the arrowhead on the left above "Info" once, perhaps twice if it doesn't start. You may have to tug on the @ sign in the middle of the red line. Cold is a powerful anti inflammatory, reducing swelling, inflammation and pain. It costs nothing and has no side effects. The treatment of choice for Patello Femoral Pain syndrome. Whilst pain and arthritis UNDER the kneecap is readily treatable with chiropractic techniques, ARTHRITIS PAIN IN KNEE ... is far more obdurate. Weight loss is the single most effective treatment if you are overweight, but mobilisation of the knee, rehab of the joint and muscles can be very effective. Can't or won't lose weight? Expect to be disabled long before your time. The wheelchair... and pain, lots of it. 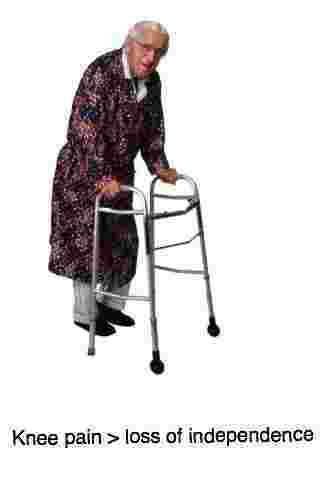 Symptoms of arthritis in knee are unmistakable. Knee pain in the limping child? Could it be perthes disease of the hip? The hip has a penchant for referring pain to the knee. In every case of knee pain, the hip should also be examined, but never is this more true than in the limping child complaining of vague pain in knee, thigh and groin. This may not be patello femoral pain syndrome at all, but another far more serious hip condition which often refers pain to the knee. Please, please, please! Never write leg pain off to growing pains. There is no such thing, and it could be something serious. Read more about perthe's disease; don't miss it. The consequences will be tragic, and I'm not exaggerating. Nothing less than a ruined life. Never will I forget the lecture given by a leading orthopaedic surgeon who told a group of chiropractors how often he had to cover for colleagues who had operated on a knee, having missed the fact that the knee pain was simply being referred from the hip. An aside. Do chiropractors miss things? Yes! I do, so I presume my colleagues do too. Is your excellent chiropractor just getting too busy? Always running late? You have the feeling you are on a treadmill. In and out? Short on listening to you? Little or no examination? Does he make case notes? It's a problem we all have, and I have to speak to myself very firmly occasionally! To find a good chiropractor is never easy, but perhaps it's time to consider a move to a younger graduate who will indeed be short on experience, but have more time to diagnose and treat your patello femoral pain syndrome. 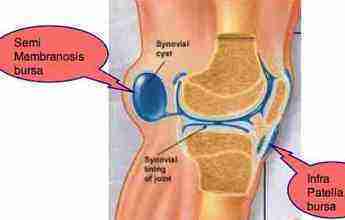 Arthritic knees go hand in hand with a condition in which the synovial fluid in the knee can leak out into a bursa behind the knee. A painful lump forms preventing flexion of the knee. Acute knee trauma - consider chiropractic help before surgery. CLARKE'S TEST ..., the definitive test for PFPS. Continuing sharp groin pain following a total hip replacement and lower back operation for a spondylolysthesis, and a fall on the knee - Helen.